Mukuba Hotel, known as the gem of the Copperbelt, is one of the most representative hotels within the Tourism sector in Zambia.Mukuba Hotel is owned Zambia International Trade Fair with 76% shareholding and the Government of Zambia on 24% and stands on Plot 2735/ rem 2735A of the Trade Fair grounds in the Copperbelt provincial headquarters of the City of Ndola on a 6 hectare piece of land. It is 7 km from the business/administration district of Ndola and 4 km from Simon Mwansa Kapwepwe International Airport. 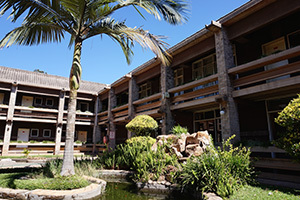 Mukuba Hotel was established in 1986 as a subsidiary of the Zambia Show Society which is a forerunner to the Zambia International Trade Fair. It started operations in 1988. It was officially opened by the first Republican President Dr Kenneth David Kaunda. The ZSS changed its name to Zambia International Trade Fair in 2011 and changed its legal status to company limited by shares. The hotel has 54 guests’ rooms which comprise of: 31 Twin rooms, 1 Executive twin room, 7 Standard double rooms, 7 Executive double rooms, 2 Luxury Suites and 1 Deluxe Suite. 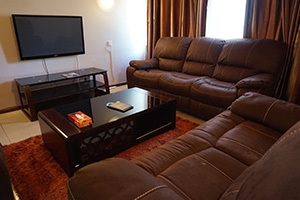 Additionally, the hotel has 1 x 2 bedroomed flat and another 1 x 1 bedroomed flat, both which have self-catering facilities All rooms are have Tea/Coffee making facilities, bedroom and bathroom telephone extensions, a refrigerator, a 24 hour DSTV channels and wireless internet. Further, within the hotel, is a three bedroomed guest house also with all the above mentioned facilities. 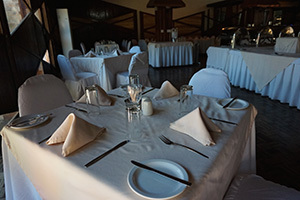 Currently, the hotel has a Restaurant called “Chondwe” which can only comfortably sit an average of 130 dining guests. This is a challenge that prompted management to purchase a marquee which is used during events with large functions. The Hotel can boast of the capacity and human resource abilities to host outside catering functions of any magnitude, starting from individual to state functions, despite the limping fleet of vehicles. The hotel has three main conference rooms to cater for seminars, workshops and other meeting, these are: Main Conference Room on first floor, Imbalasa Conference Room on the ground floor, The Presidential Pavilion in the Trade Fair grounds. The limited capacities of the above three facilities have prompted management to employ the use of big tents (Marques) to accommodate large groups and functions. This has been a good attraction to Mukuba Hotel with its picturesque setting. 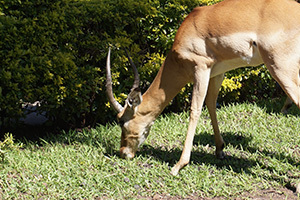 The hotel grounds provide a hospitable and serene environment with free roaming animals composed of 22 Impalas, 1 Duiker, 8 Peacocks 6 Guinea Fouls and Village Chickens. 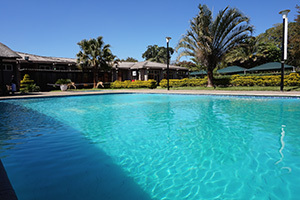 This provides the hotel with a unique setting not available in most hotels in the Copperbelt. The Hotel also has as fitness center in addition to a volley ball court that was recently introduced. The main customer base for Mukuba Hotel is drawn from corporate customers for the accommodation of their staff who visit the Copperbelt regularly. The hotel has also found favour among the expatriate community who like the secure environment that the hotel offers. It is quite often and regular to find more expatriates of foreign nationalities staying in the hotel more than the number of Zambians. The hotel is currently facing stiff competition from up market lodges that have come up in Ndola and Kitwe. It is foreseeable that there will be many more hotels that will be developed in kitwe and Ndola. For this reason Mukuba Hotel has started taking steps to reposition itself to meet the emerging competition. Management at Mukuba Hotel has recognized the urgent need to reposition the hotel for future success. In this vein the following programmes are being implemented this year in two phases. The first phase involves creating greater ambience in the rooms by replacing the bed linen in use, replace the TV sets to modern LCD TVs and modernize other furnishings and fixtures in the rooms. This phase will also see the front office (reception) remodeled to higher standards. The inner bar and restaurant will also be remodeled and given a new look and feel. The second phase will involve increasing the room capacity by an extra 100 to 150 rooms. Also to be added on is a large conference centre to accommodate up to 2,000 guest in theater style seating.